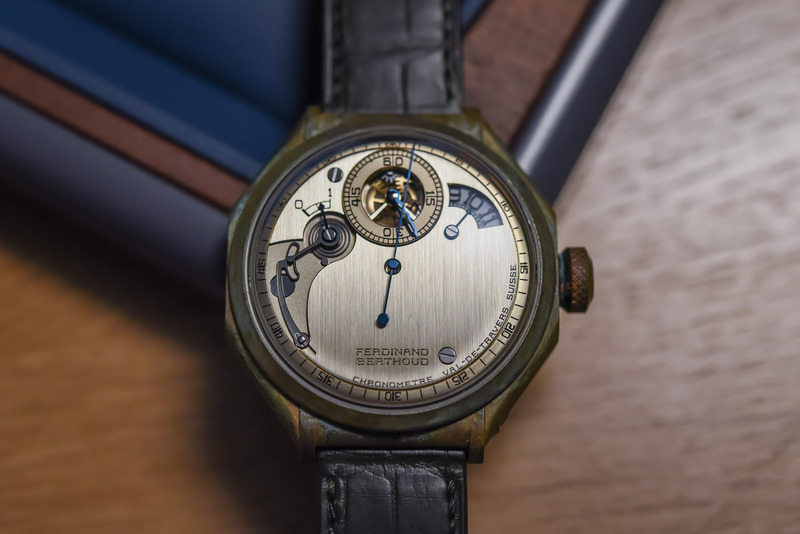 Ferdinand Berthoud unveils its most exclusive edition to date, its first unique piece. With the Malaspina Edition, Ferdinand Berthoud explores the theme of the “Age of Discovery” in relation to marine chronometers. Alessandro Malaspina was an Italian-born navigator, who spent most of his life at the service of the Spanish Navy. In particular, he led the Malaspina Expedition (1789-1794) exploring and mapping the west coast of the Americas throughout the Pacific Ocean. To guide him in this scientific-political expedition, Malaspina navigated with two Berthoud marine chronometers, N°10 and N°13. In 1791, Malaspina’s two frigates stopped in Acapulco, Mexico, and officers were sent to Mexico City. On his return from Alaska in 1792, Malaspina docked in Mexico again before setting out to explore the Pacific Ocean – hence the presentation at SIAR (Salon Internacional Alta Relojería), the fine watch salon held every October in Mexico City. More about the Malaspina Expedition here. 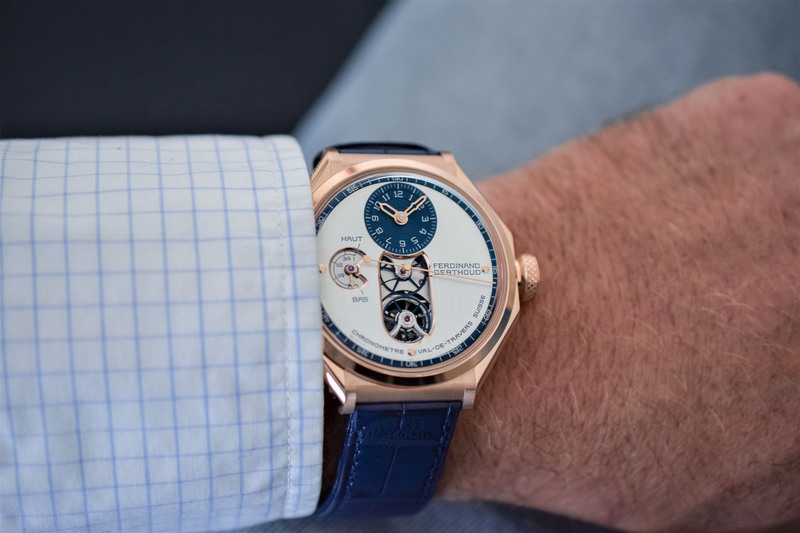 The Malaspina edition is a pink gold version of the Ferdinand Berthoud Chronometer FB1. 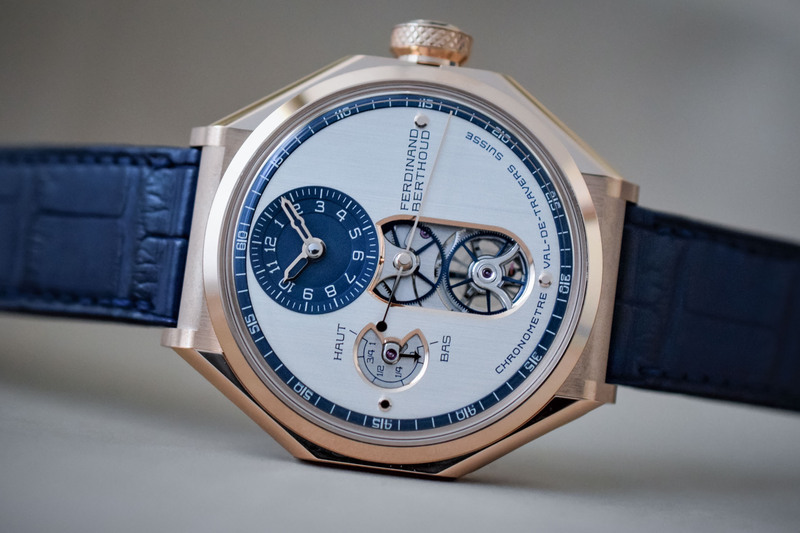 A small but interesting design change is that, unlike previous versions in pink gold, this unique piece does not feature the ceramic inter-lug inserts (in fact, just like the recent platinum or titanium versions). As a result, this full gold case looks lighter and dressier than before. The crown no longer features an insert either. Measuring 44mm in diameter, the octagonal case is inspired by Berthoud’s marine clocks and their gimbal suspension system. 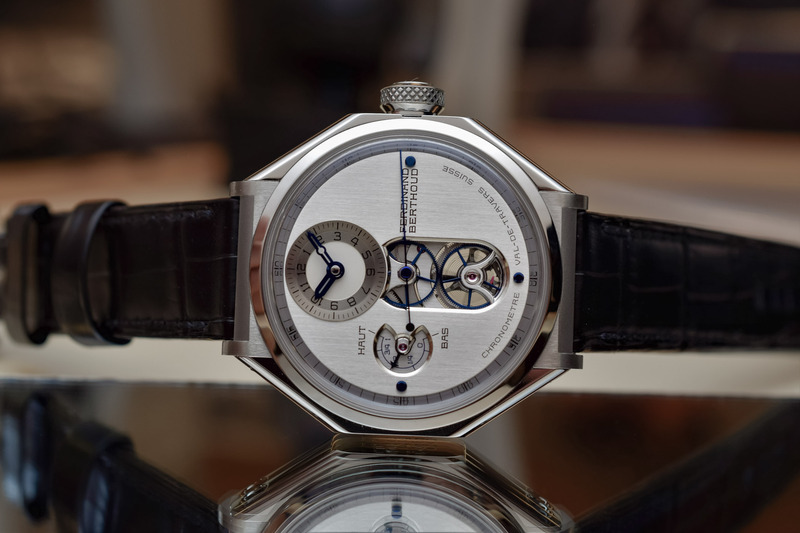 Four lateral portholes allow for different perspectives on the movement, in particular, the fusée-and-chain mechanism. 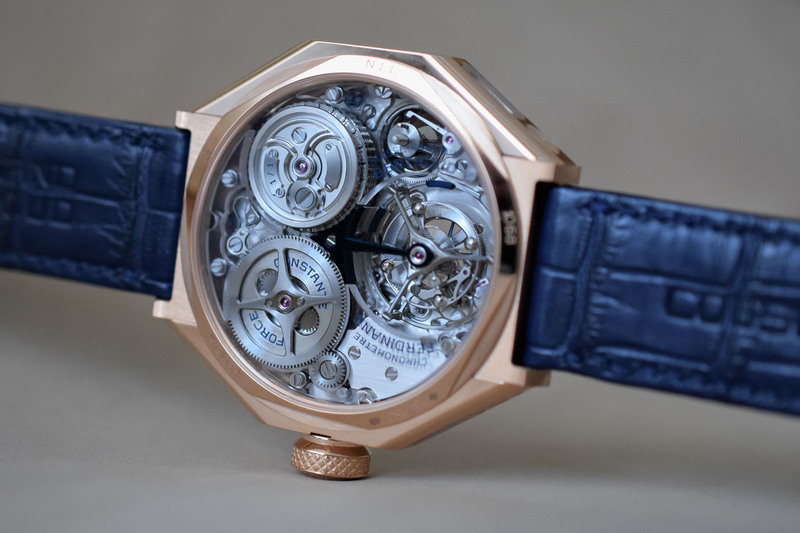 The Malaspina edition is also the first gold FB1 to house the sapphire bridge version of the movement introduced last year on titanium versions. These allow for a striking view of its spectacular pillar architecture, oversized tourbillon and fusée-and-chain mechanism. 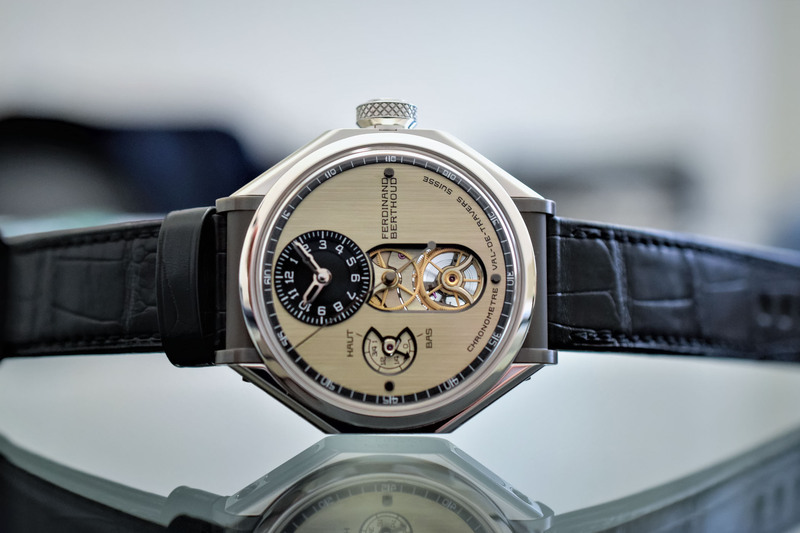 Comprising over 1,100 parts, the hand-wound calibre is regulated by a tourbillon regulator ticking at 21,600 vibrations per hour. The barrel can store 53 hours of power reserve. A Maltese cross stop-work is fitted directly on its drum to prevent overwinding. The fusée-and-chain provides an almost constant flow of energy to the regulator. 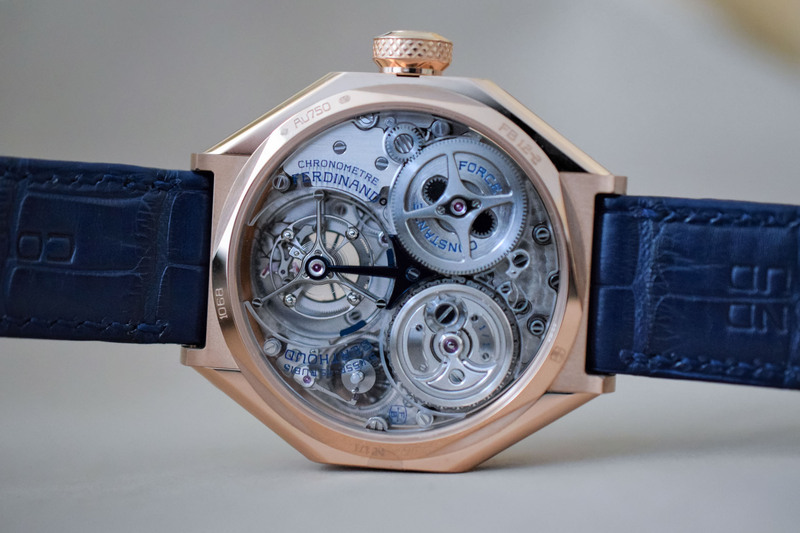 Also visible through the transparent bridges, the power reserve is indicated thanks to a truncated cone moving up and down along a threaded arbour. 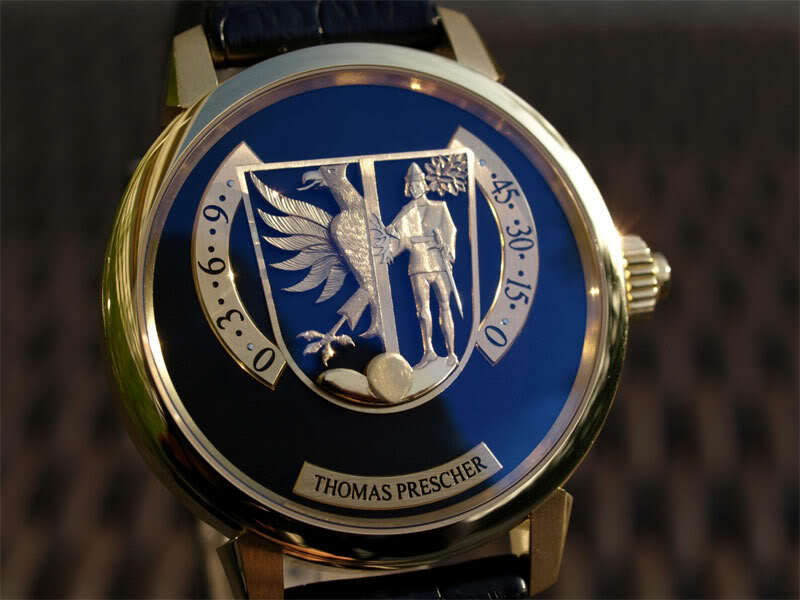 As with all Ferdinand Berthoud watches, this unique piece’s precision is chronometer-certified by the COSC. As we have come to expect from the brand, the finishing is top-notch. It is even more impressive here, as all the parts are on full display under the sapphire bridges. To perform this high level of finishes, watchmakers control their work with x6 magnifying lenses. 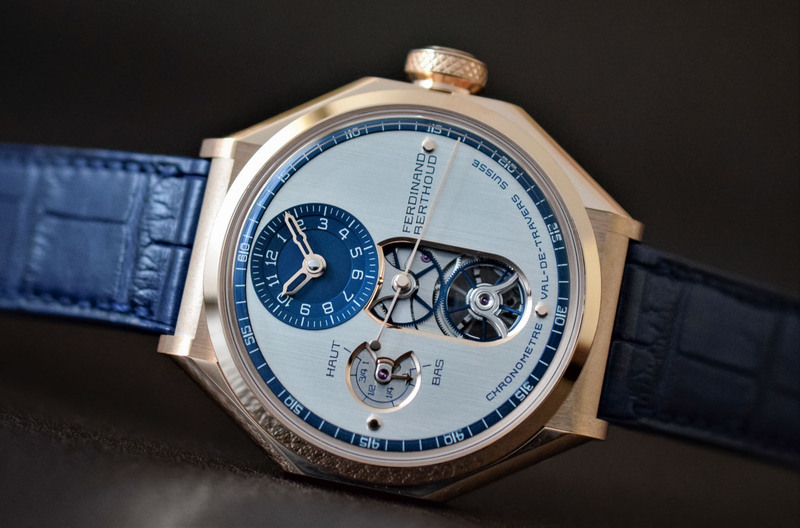 The 67-part titanium tourbillon carriage is held in place by a blued, thin arrow-shaped bridge. 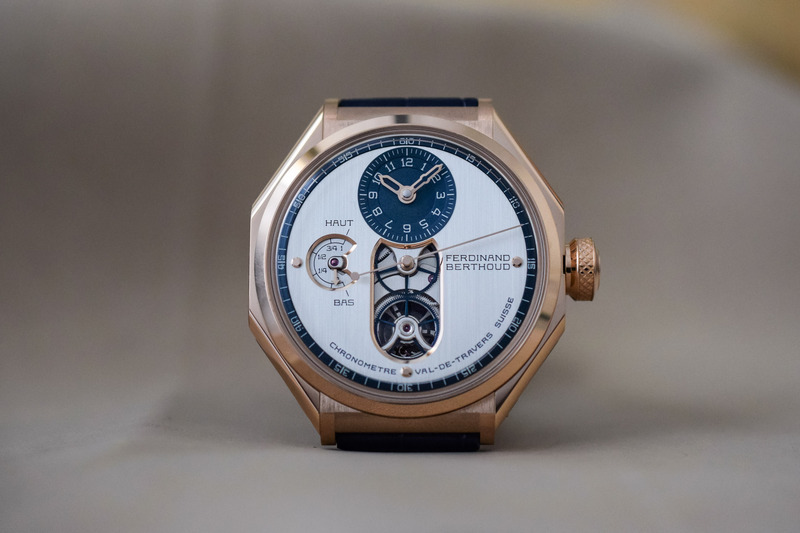 The balance wheel features adjustment weights and the hairspring a hand-shaped Phillips terminal curve. Finally, the dial also presents some refined changes. 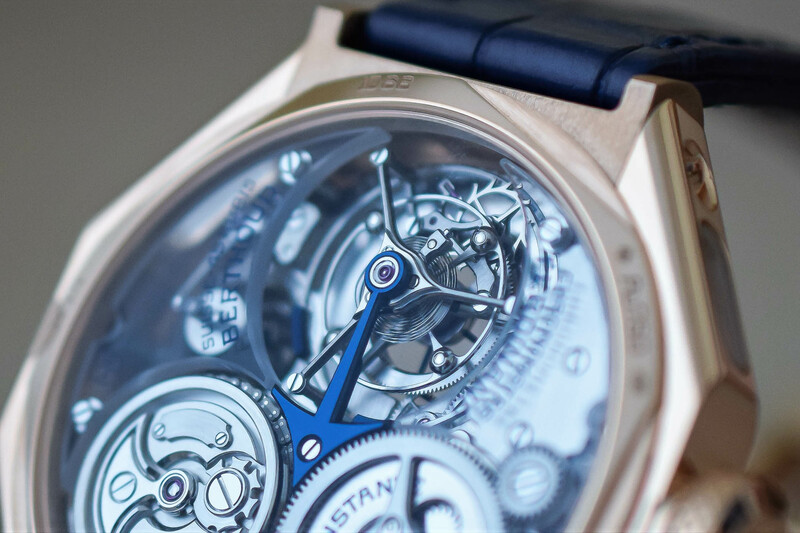 It features a vertical satin-brushed finish paired with blue accents on the tracks and sub-dial, as well as on the visible wheels. The perfectly polished chamfers are pink gold-plated. 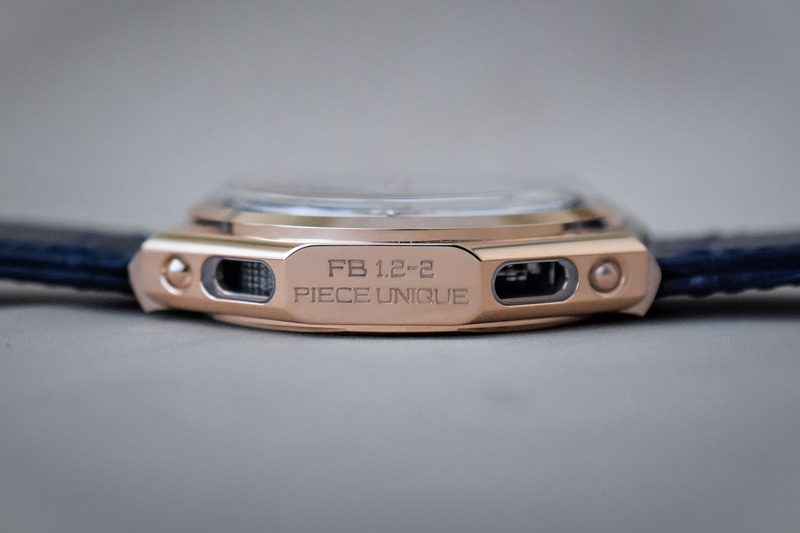 Like all FB1 watches, it is highly legible with off-centred hours and minutes and a direct-drive central second. The power reserve is displayed at 9 o’clock. 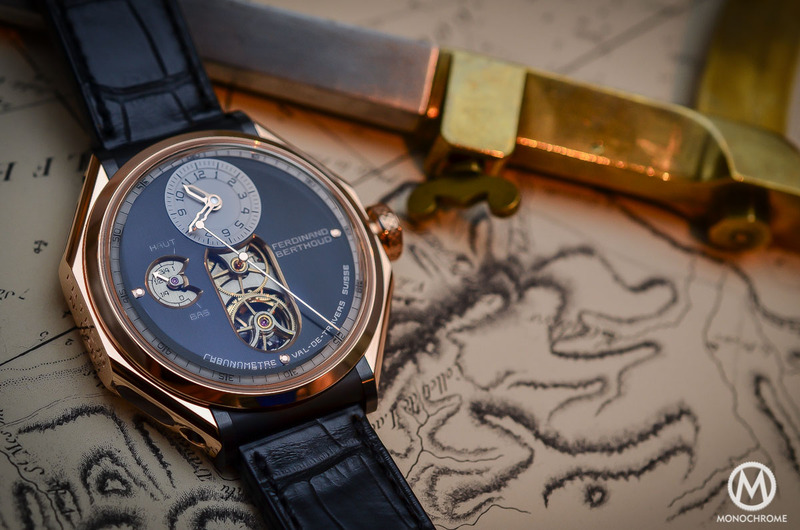 The central cut-out reveals the seconds wheel-and-pinion and the driving wheel of the tourbillon carriage. The Ferdinand Berthoud Chronometer FB1 Malaspina Edition comes with a dark blue alligator strap with alligator lining. It is secured with a safety folding buckle and a comfort-enhancing extension system. This unique piece is priced at CHF 225,500. 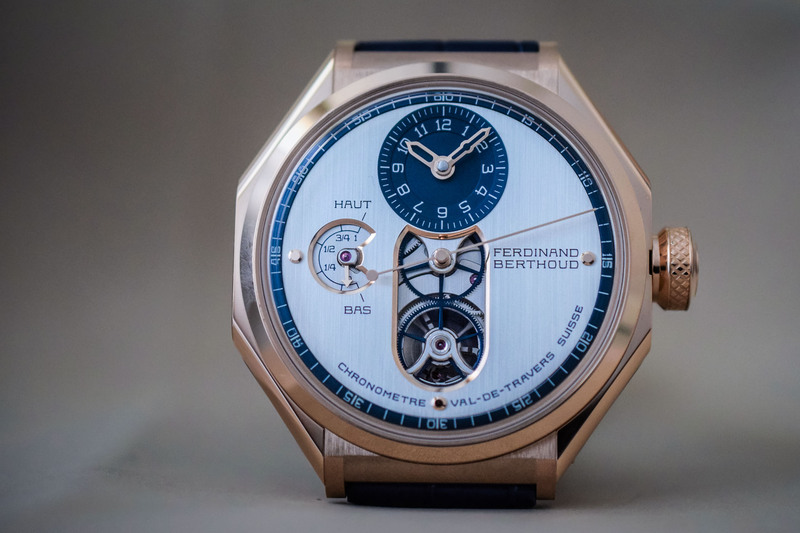 More details on www.ferdinandberthoud.ch. I can only dream of getting out…getting anywhere…getting all the way to the FB1.